In the past, a PC's hard disk drive was connected through an interface called Parallel Advanced Technology Attachment (PATA or just ATA). It was called that because it used a flat 40-wire parallel cable and it replaced the older Integrated Drive Electronics (IDE). As PATA speeds got faster, interference between wires began to develop. The maximum transfer rate with PATA was 133 Mbps. To overcome this problem, the Serial ATA (SATA) interface was developed. The (SATA) interface uses a 7-wire cable. The latest version (SATA 3.0) has a data transfer rate of 6.0 Gb/s. Initially all SATA (and PATA) interfaces were for internal hard disks. With the introduction of eSATA, the SATA interface can be used with external storage media. 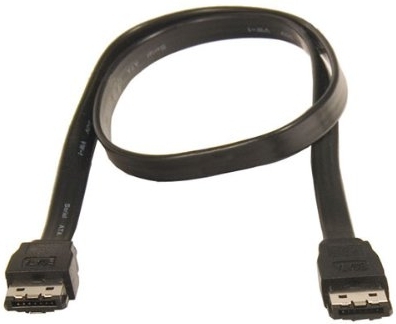 This puts eSATA in competition with Universal Serial Bus (USB) and Firewire. Especially since, like USB and Firewire, eSATA allows hot swapping (adding or removing a device while the PC is running). Over the years USB and Firewire have each taken the performance edge away from the other, and now it looks like eSATA has entered the fray. To state which has the advantage today would not be productive, since that may change tomorrow.